Article by Nicholas J. Korfias, found in Shop Metal Tech Magazine. A minute chip floating in coolant swarf left to dry on a toolholder taper can become a serous interference at the machine tool spindle-toolholder interface. It can go undetected, causing slightly increased cutter runout(TIR) and diminished tool performance at low spindle speeds. At higher spindle speeds, the negative effects are magnified and can result in scrapped parts, catastrophic failure and a possible accident. A contamination-free toolholder and machine tool spindle interface ensures toolholders properly seat at full taper contact and are pulled into the spindle taper at maximum force. With holders held and positioned accurately, a machine’s full power and tolerance capabilities can effectively and safely transfer to cutting tools, while runout and vibration are reduced for superior part surface finish quality. The following are eight simple tips for maintaining toolholder-machine spindle interface accuracy and integrity. 1. Shops should clean and inspect toolholders and spindles after every job. Toolholders should be completely disassembled and cleaned. Today’s’ synthetic and semi-synthetic coolants can leave surfaces gummy, causing chips and other contaminants to easily adhere to them. Machine spindles should be cleaned and visually inspected before being returned to service. An oil-dissolving cleaner can be used to clean coolant residue from tollholer and spindle surfaces. 2. Spindle cleaning should be done as part of the overall machine breakdown routine that happens after every job. 3. Dust-free cloths or paper towels with light penetrating oil and manual wiping tools work best for cleaning the spindle socket surface. Most manual wiping tools feature helical cleaning blades set at angles matching those of a machine tool’s spindle. Once surfaces are cleaned, they should be sprayed with a coat of light penetrating oil to prevent rusting. 4. Shops should use a “ForceCheck” device to check their machine spindle’s puling power on a quarterly basis. This practice should be employed as a preventative maintenance procedure, with results recorded and tracked. Any sudden drops in pulling force from one quarter to the next can indicate a potential issue with the spindle system and can provide early detection for preventing catastrophic failure. 5. If possible, a tool crib manager of designated tooling person should manage toolholder maintenance. As jobs are completed and tools are returned to the crib, cutters and holders should be completely disassembled and all components cleaned manually or in an ultrasonic system, then reassembled. Ultrasonic cleaning system quickly and efficiently clean toolholder tapers, collet cavities, holder nuts, collets and all the other smaller sub-assembly holder parts. 6. If toolholder tapers show visual signs of wear, manufacturers suggest running them through an automatic powerbrush wiping system that uses rotating tapered brushes. After doing so, holers should be cleaned in a n ultra sonic cleaning system, wiped clean and sprayed with a coating of light penetrating oil. 7. Once spindles and toolholders have been cleaned, a visual inspection should be made of the surfaces. They should be free of any defects. 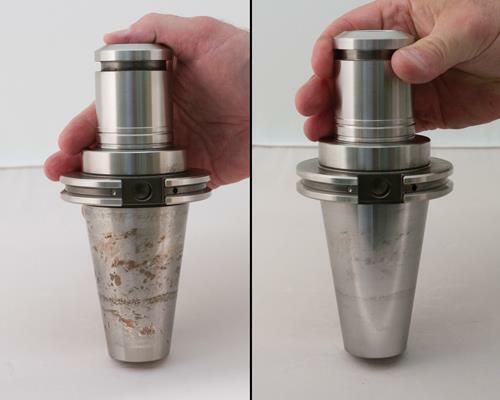 If serious damage is found in a spindle interface surface, a professional may be needed to re-grind the spindle taper socket. Damaged toolholder or machine spindle surfaces left dirty or unrepaired will, in turn, damage other tool and machine spindle mating surfaces. 8. Once tooling has been cleaned and properly maintained, store it to avoid any re-contamination as it moves from tool crib or tool cart to machine tools. Surface rust can occur while tools are stored, so they should always be sprayed with a coat of light penetrating oil. Shops should only load clean tool holders into machine spindles and automatic tool changing (ATC) systems. Again, dirty or damaged toolholder surfaces can easily transfer imperfections to other toolholders and onto machine spindle surfaces. If your toolholders or spindles have reached the end of their useful life, visit out store at store.multicam.com or call us 972-929-4070 and order a replacement right away!